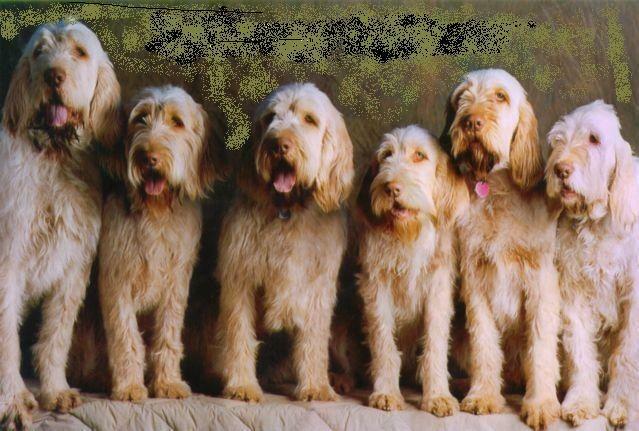 Search and adopt a Spinone Italiano near you. The Spinone Italiano, or Italian Pointer, is Italy's all-purpose hunting dog. An excellent retriever and an experienced hunter. The Spinone is robust, sociable and docile with awiry, dense coat and thick skin. The coat can be solid white; white and orange; orange roan with or without orange markings; white with brown markings, brown roan with or without brown markings. Cross between coarse-haired Italian Setters, bred with those left by Greek traders and others from the Adriatic coast, in addition to crosses with the White Mastiff and perhaps French Griffons. The breed is believed to have been developed in the Piedmont region of Italy. As the Spinone is a very ancient breed, it is not known exactly what the origins of the breed are; there are many different theories. Some of these claim that the Spinone could have originated in Italy, France, Spain, Russia, Greece, or Celtic Ireland. The breed was not officially known as "Spinone" until the early nineteenth century. Before then, some areas knew the breed as the "Spinoso". The breed was named after an Italian thorn bush, the pino, which was a favorite hiding place for small game because for larger animals it was practically impenetrable. Only thick-skinned, coarse-haired animals could fight through the branches unharmed to locate the game. The Spinone was the breed most capable of doing so, and therefore the name was formed. The Spinone is easy going, docile, and affectionate towards both people and dogs. It is well known for being loving and gentle with children. Extremely patient nature. It is loyal to those it knows and still friendly to those it doesn't. The breed is not known for any aggression and is therefore not a wise choice for somebody looking for an aggressive guard dog. The Spinone can be a very active breed. The Spinone has been called the perfect dog to run or jog with, because it will not run off in front and leave its human companion struggling to keep up as it prefers the slower pace itself. In part due to its long beard, the Spinone can have a tendency to slobber.